My daughter's favorite book is "An Exaltation of Larks", which lists many colorful names given to groups of things (not just birds). E.g. : an ostentation of peacocks, a parliament of owls, a charm of finches, a murmuration of starlings and -- of course -- a murder of crows. 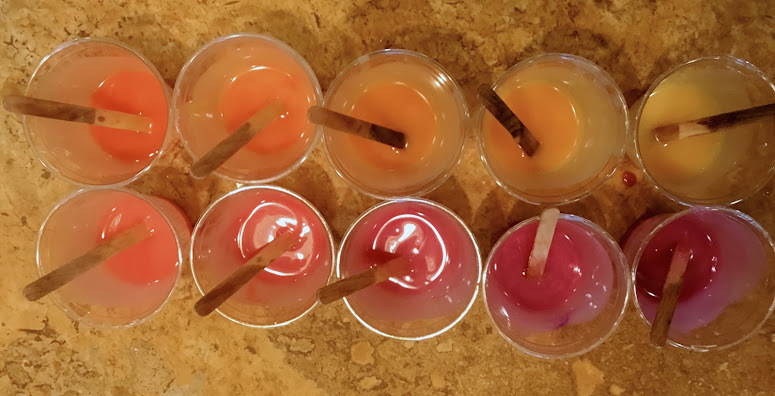 For each batch, I used 10 shades, and following Amy's advice, I didn't measure out my colorants, but instead tweaked the colors by eye, drop by drop. The orange I used was very frustrating, as no matter how much I mixed it, it was determined to make spots! The printed version is shown below, from my optimistic first attempt. 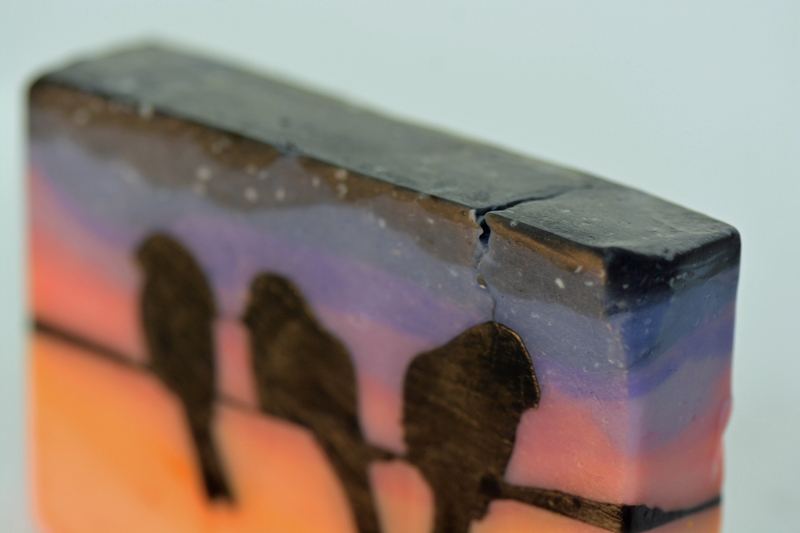 As you can see from the close-up below, the soap cracked when I tried to cut it. You can also see that the gradient isn't at all smooth, as I tried to use too many shades. For my second try, I hacked up the cutter, but the batch ended up way too pink. So, the third try, below, is the final one (shown with the dissected cutter parts). 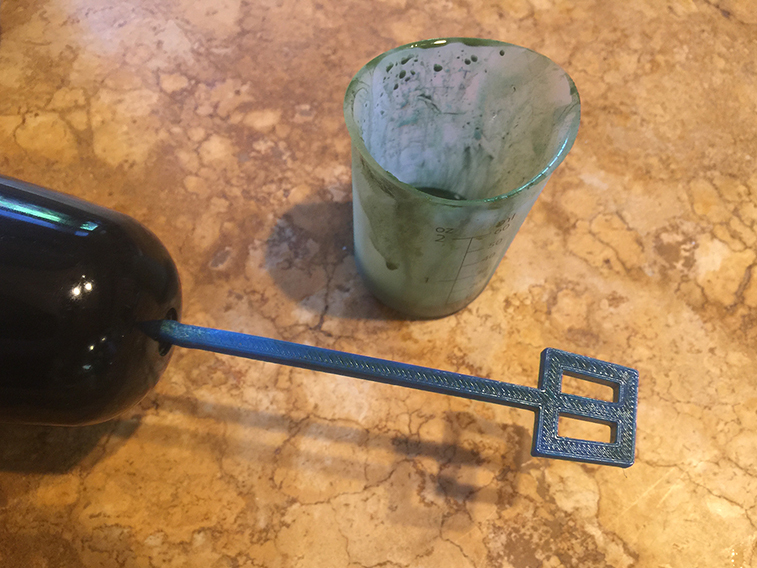 I mixed it with a wire whisk attachment on my stick blender until emulsified, then added 1 oz/ppo of Nurture Soap's 8th and Ocean mixed with my favorite decelerator (Nature's Garden White Tea & Ginger). The result is too sweet-smelling for me, but it was very well behaved. I also used my standard 1.5:1 water:lye ratio and added a modest amount (for me!) of Sodium Lactate (0.25 oz/ppo), so it would be firm enough to hold its shape when unmolded, but not crack when I cut the birds. As for the gradient layers, I measured out 10 equal amounts of batter, colored them and mixed them very well with a mini mixer (which I hate, as they're so under-powered and add bubbles, grrr!). I let it sit a bit to thicken up, then spooned in each layer and smoothed it out. I CPOP'd both the loaf and the bars at 140F for an hour, then left them in the oven for another 3 hours. 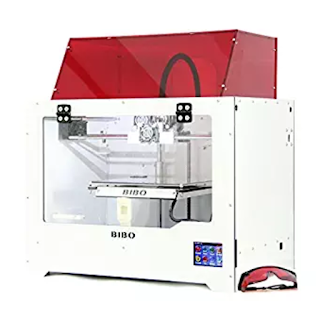 I think that most folks in the US have access to a 3D printer at their local library, but all ours are booked until next year; one of the problems with living in Silicon Valley. 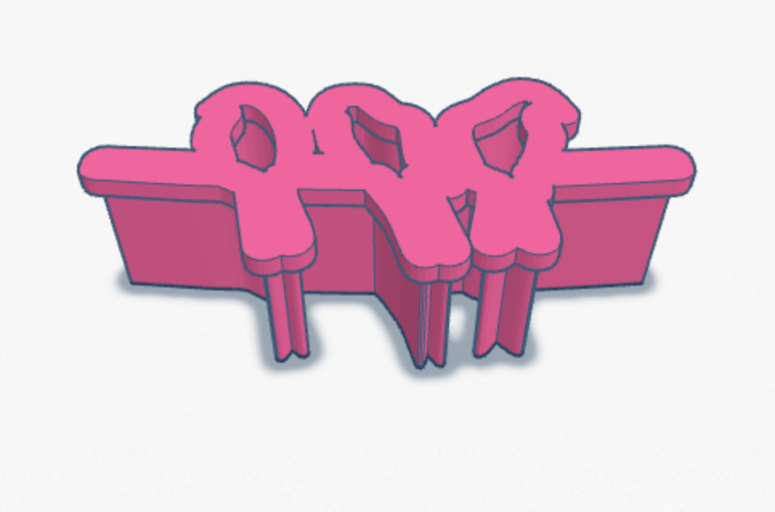 Otherwise, you can order prints from TinkerCad, like I did. It was pricier than I'd hoped ($12, including shipping), but came in less than a week. It's very crude, and the mixer may be too powerful -- you can see that the green color + oil I mixed had it coming out of the top. I'm going to order a variable speed mixer, which may help, but I really need to add a hood to the attachment to make it work right. Way to leave us hanging, Claudia!! What an incredible soap! Did you sculpt it? I'm dying to find out! Gorgeous colors!! I know, right? It's a murder mystery! Or it was, as I've finished the post. Wow!! I'm finally getting back to take a look! How cool!! That 3D printer is going to come in handy for a lot of things. What an amazing tool! It's really fun, I must admit. :) BTW, this technique is essentially what you called "Negative Space Embedding" in an earlier challenge. Beautiful! How did you inserted the silhouette on the soap?What technic did you used? Thanks! I was originally planning to make embeds with my cutters and insert them as I poured. I realized that no matter how hard I tried, though, they would interfere with a smooth gradient. How did you insert the silhouette in the soap? What technic did you use? Simply wonderful work! Good luck !!! Claudia, you are so resourceful! I love this. Makes me think of the song..."Don't worry about a thing. 'Cause every little thing gonna be alright!" 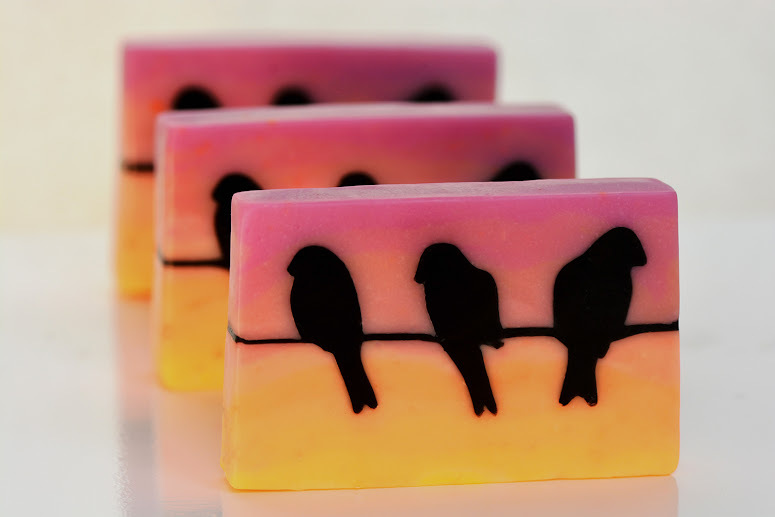 I love your soap, and those crows too - no matter what....!! I love your soap and the fact that you had to go out buy a 3d printer can not wait to see what you do with that ! 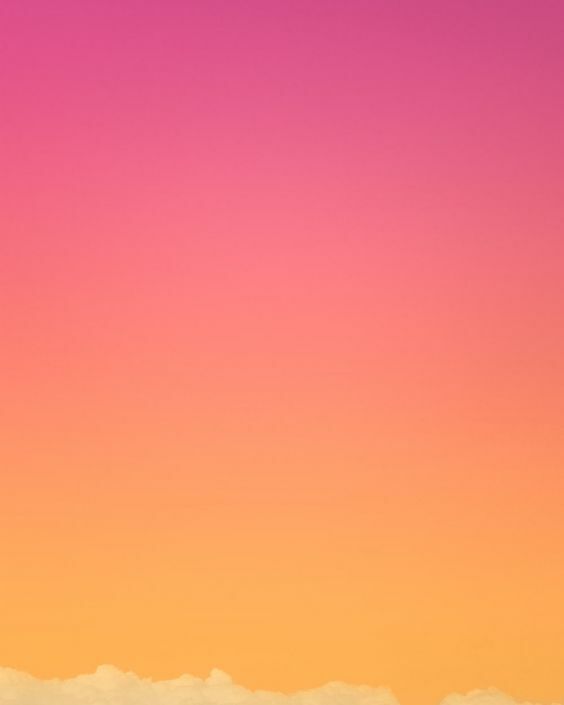 I love ambre sunset and the birds are too cool nice! WOW - that is one gorgeous soap. The sunset colors are perfect. And I learned something new - a bunch of crows is really a murder of crows. Wonder if that was Alfred Hitchcock's inspiration in the movie "The Birds". Very well done Claudia (as always). Will look forward to seeing what you make with your new 3-D printer. Perfect I love this "murder of crows" awesome effort and beautiful soap! Lovely soaps - all of them! Ingenious plan and I totally agree much better than a stamp, which would be gone after the first use....this is great how it goes all the way through. I think making the embeds and inserting into the pour would have worked well too. Congrats to you for getting your own 3-D printer....I wouldn't know what to do with it, but would love to see the mixer attachment you make. I enjoy all your Blogs and always look forward to reading them...and drooling over your soaps. PS: sorry if this turns into a repeat comment - the first time I wrote it, it disappeared before I his publish, so not sure where it went. Thank you, Sly! Always happy to see your comments! I went to your blog, but you skipped this challenge, eh? Are you still doing them? These turned out just beautifully Claudia! Now to convince my husband on getting a 3D printer! Just FYI, the printer came, and it's HUGE -- like 14" x 18" x 14"! The few instructions it came with are all in Chinese, and we didn't get it to work, yet. I'm not giving up, but 3d printing is clearly bleeding edge at this point. Wow, this really shows your ingenuity, Claudia!!! It's a beautiful ombre design, and the three little birds (pitched by your doorstep) are amazing! Congrats on your well deserved win! Congratulations, Claudia! 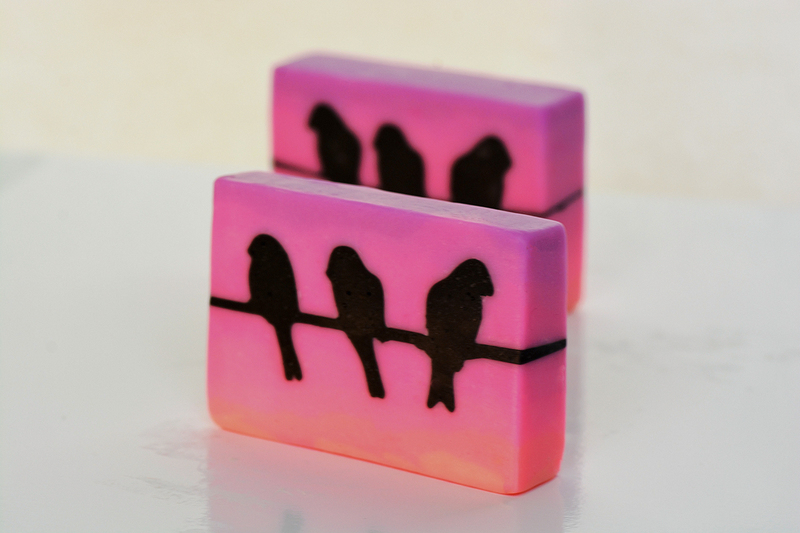 Stunning soap and wonderfully executed! It's just beautiful! I love the pink one too. Congratulations Claudia! Wow, that is amazing that you used a 3-D printer! I have had the same problem with the mini mixer. 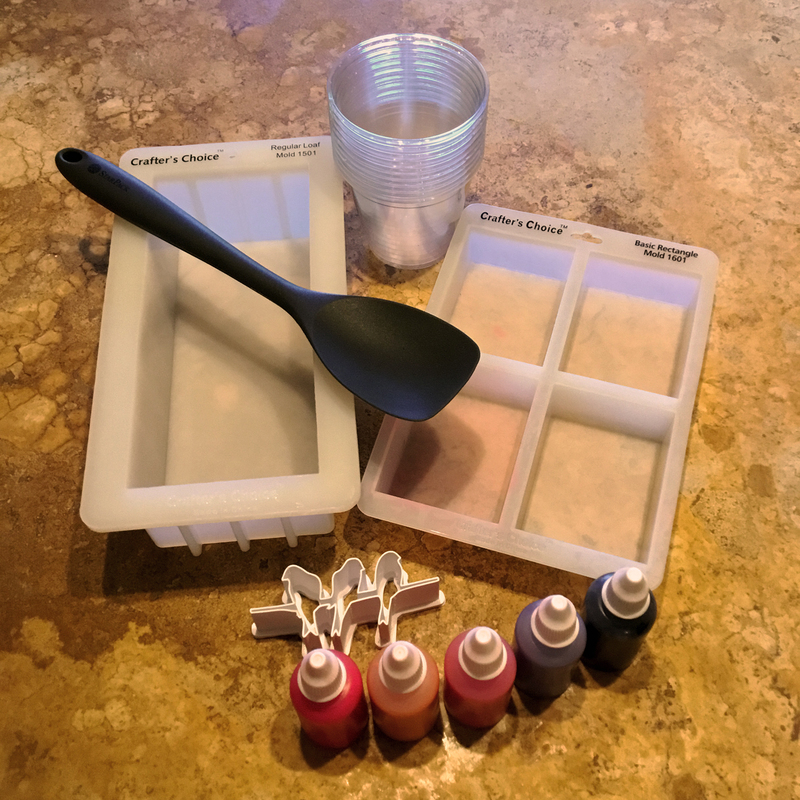 Can you really make a smaller attachment for your stick blender? That would be great; I was looking for a smaller one too. I have resorted to using a artist palette knife to mix my colors with a little bit of oil on a piece of plexiglass. It really gets the clumps out. Congratulations! This was such an awesome soap!!! How clever!! Claudia how cleaver and so beautiful! 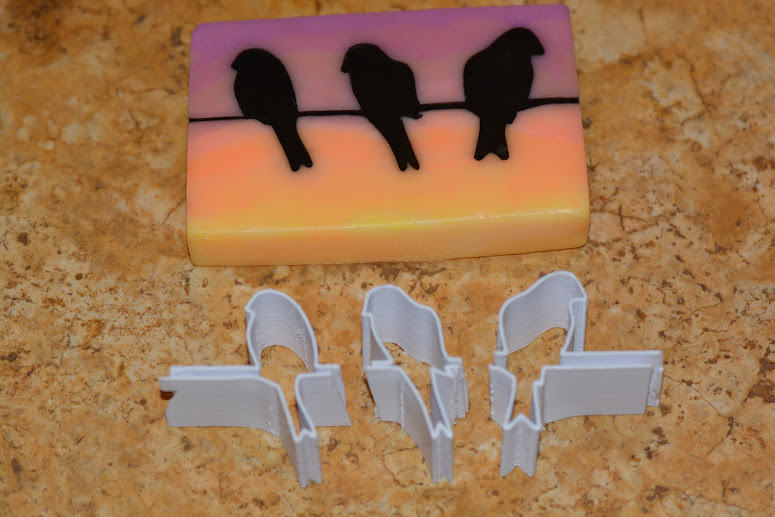 Could you print out the birds like wafer birds with your printer and anchor them into a slab mold? Pour your base and then when unmolded fill the holes where the crow/wafers left indentations? Congrats on your new printer! WOW!